We didn’t book ahead of time because last year – upon reading about huge crowds and the need to queue up first thing to go into a lottery to win the opportunity to come back later in the day for a seat in the cafe – we turned up first thing and found that there was only one guy ahead of us, and the cafe was half empty for the first session of the day. This time, we turned up about half an hour before the lunch-time session began. It turns out that this session is more popular, so we couldn’t get a table at that time, and ended up making a reservation for the 4:30pm session. This session was also fully booked by the time 4:30pm rolled around. Both visits were on weekdays, so my only explanation is that the very first session of the day might be less popular. Eorzea unsurprisingly attracts plenty of tourists, many of whom book via Lawsons, a convenience store chain. By booking this way, you get a free coaster and a free drink (although a fee does apply to make the booking this way). We didn’t bother as we were spending most of the day in Akihabara anyway, and our prior experience left us confident that we would be able to get a table. Everyone was given a Golden Saucer ticket upon entering. The ticket numbers match the seat numbers – every customer’s seat is numbered. Mine was 11. They drew a raffle toward the beginning of the session, once everyone was seated and they had gone through the other formalities. 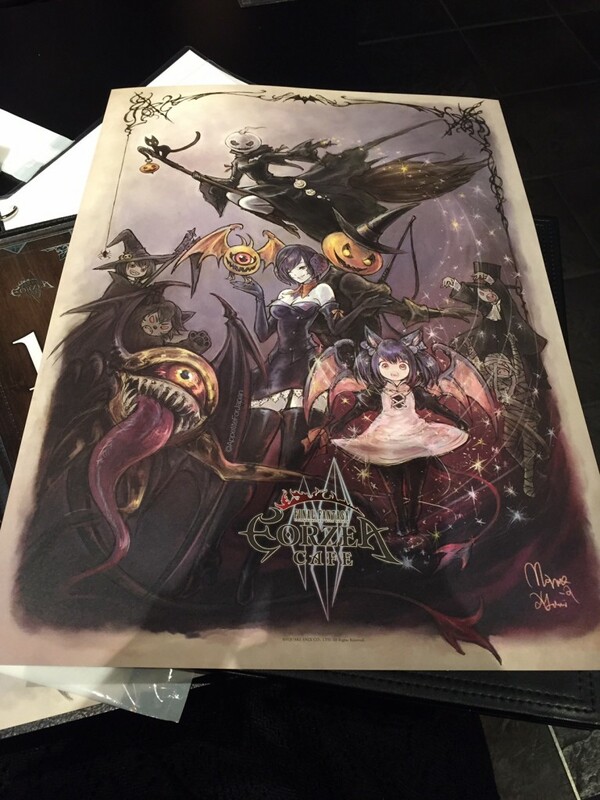 We visited less than a week after Halloween, and were given these exclusive Eorzea Cafe Halloween artwork prints. 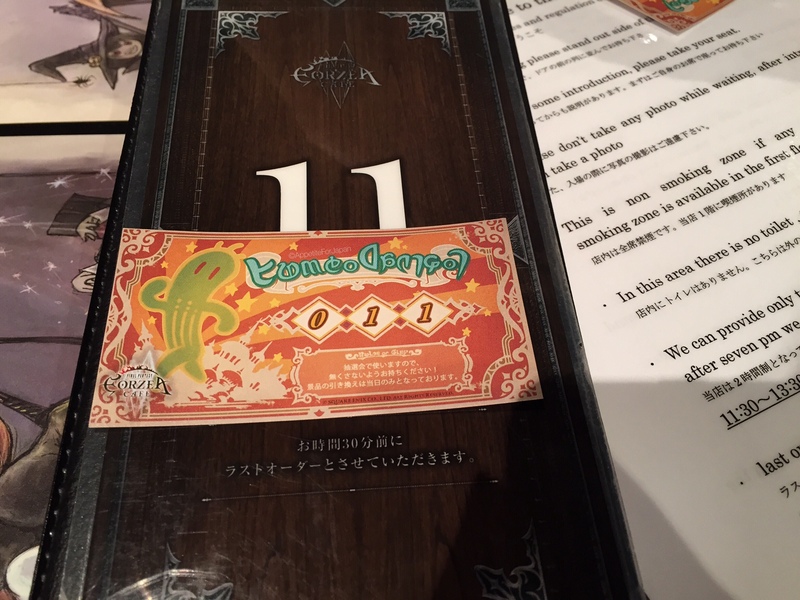 Some locals who obviously visited Eorzea regularly (they had complete collections of the coasters and lacked the obvious excitement that we saw on some of the American customers) used theirs as place-mats, while most customers took theirs home. The staff came around with rubber bands to secure the rolled-up prints with. 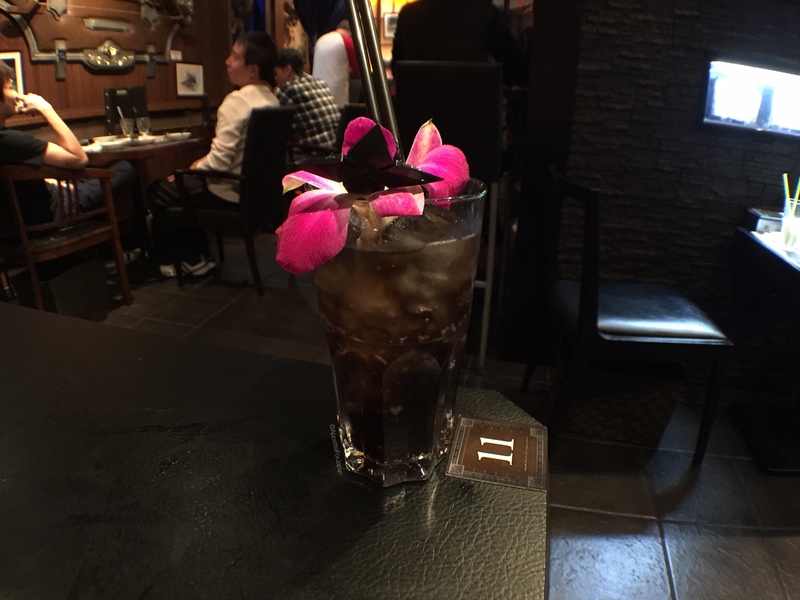 As our sitting wasn’t until 4:30pm and we had a reservation for the themed restaurant, Ninja Akasaka that night, we opted for reasonably light meals – a small savoury dish each, and a dessert – along with our drinks, all from the new 2015 menu. 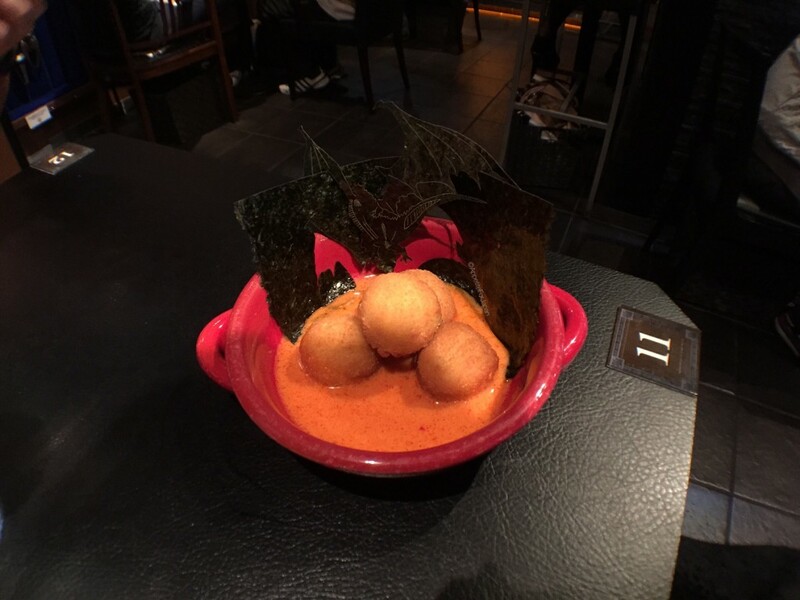 These are crumbed balls of deep fried cream cheese in a creamy sauce that tastes a lot like laksa. I like laksa, so this was a winner in my books. 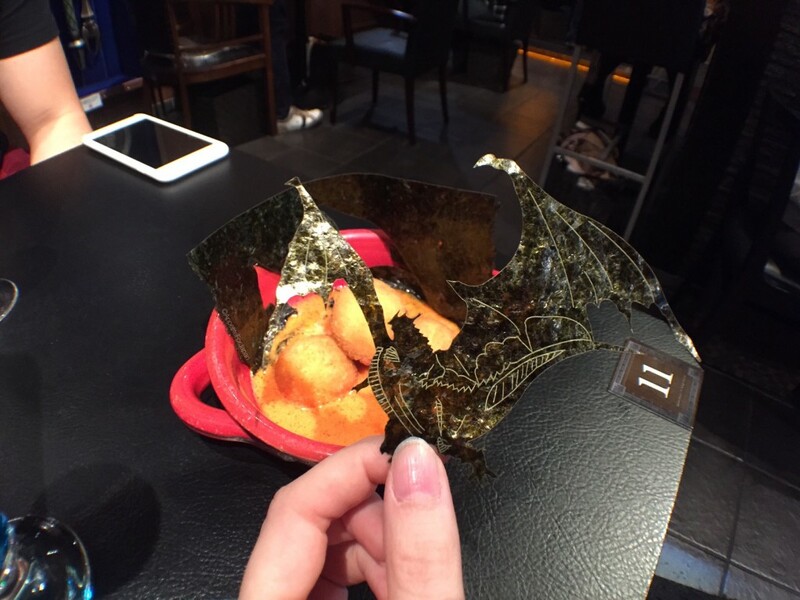 Bahamut’s Fried Cheese Like Earth Shaker comes with a seaweed dragon, and the rest of the seaweed that the dragon was cut out from. The detail is pretty cool. 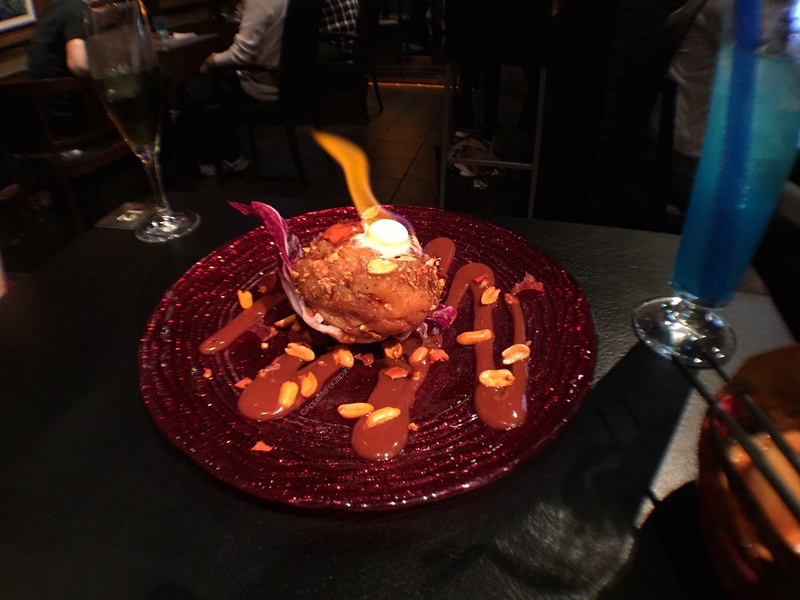 A large round croquette with peanuts and sauce, which they set on fire at the table. This was pretty decent too (although I preferred the fried cheese). 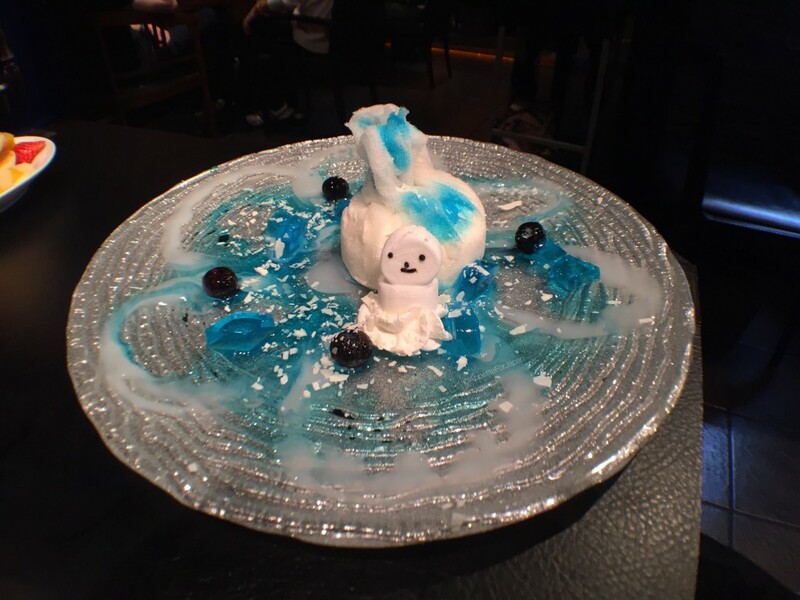 A blob of unbaked cheesecake wrapped in white cloth, icing-like sauce, blue jelly and blueberries. I’m not normally a fan of cheesecake, but this was actually pretty nice. Many of the new 2015 dishes seem to replace items from the first (2014) menu. For example, the Cremet d Anjou of Shiva replaces the Limit Break Meteo Choux A La Creme from the previous menu. 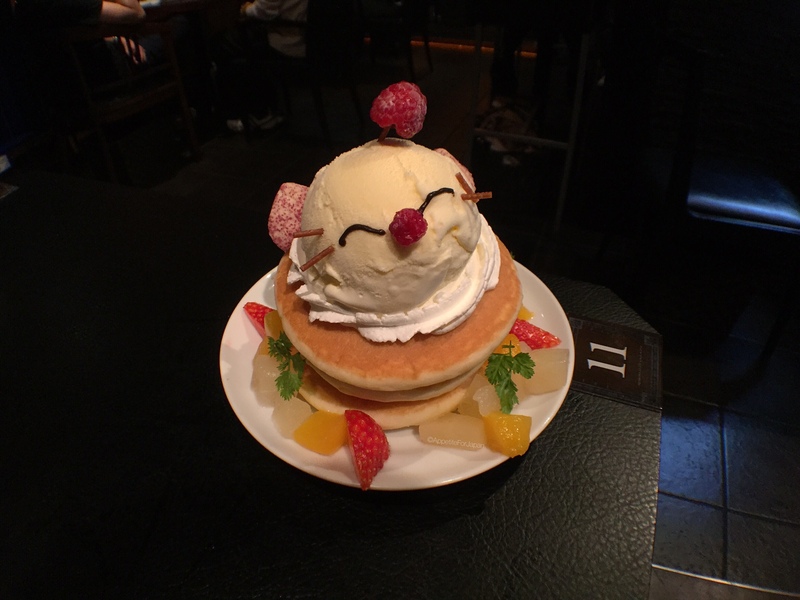 A stack of small pancakes (or large pikelets) with some cream, a Moogle made of ice-cream, and a combination of tinned and fresh fruit around the edge. This was my partner’s choice, and he said it was a bit dry. Mini pan cake of Mogli replaces the Moggle Mini-Honey Toast from 2014. 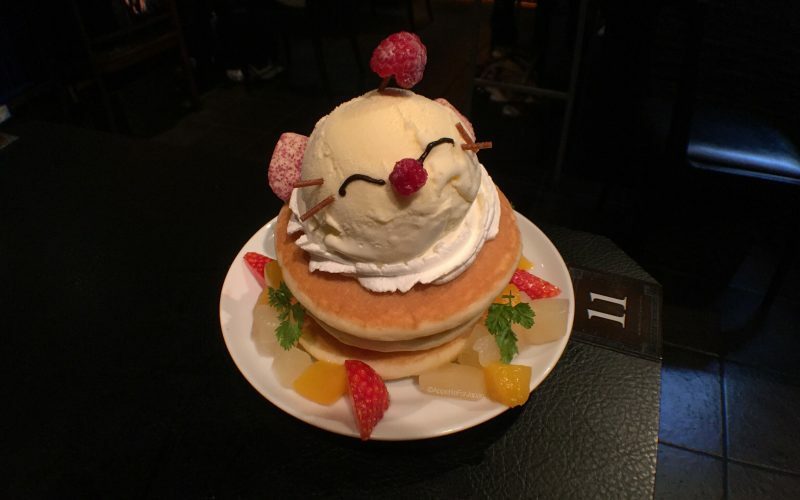 There is still a mini-honey toast dessert on the menu (as honey toast is Pasela Resort’s specialty), but if you’re after a Moogle dessert – Eorzea’s most iconic dessert – you’ll be ordering the mini pancakes on this menu. The ‘materia’ balls are just coloured pieces of ice. Strawberry milk for 650 Yen. Expensive flavoured milk drinks at themed cafes in Akihabara is obviously a running theme in my life. 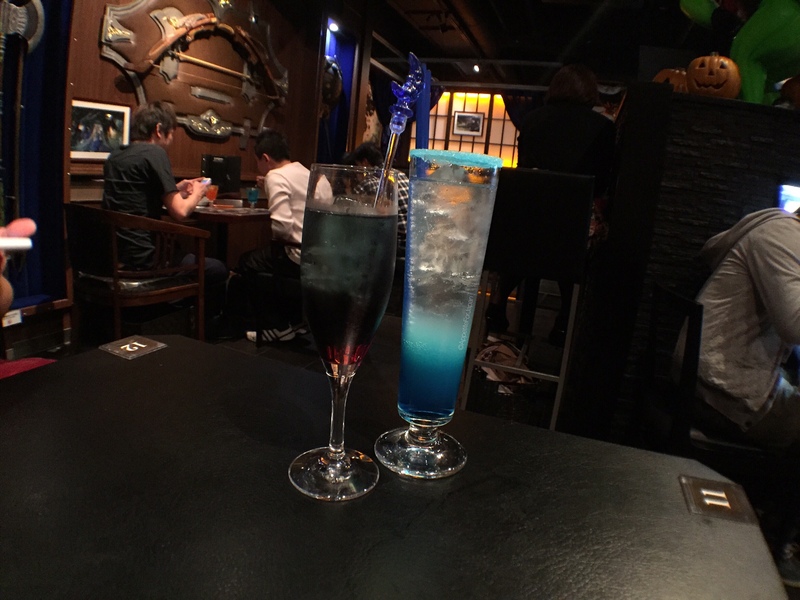 Last time I visited Eorzea, I said that the drinks were overpriced and tasted average. 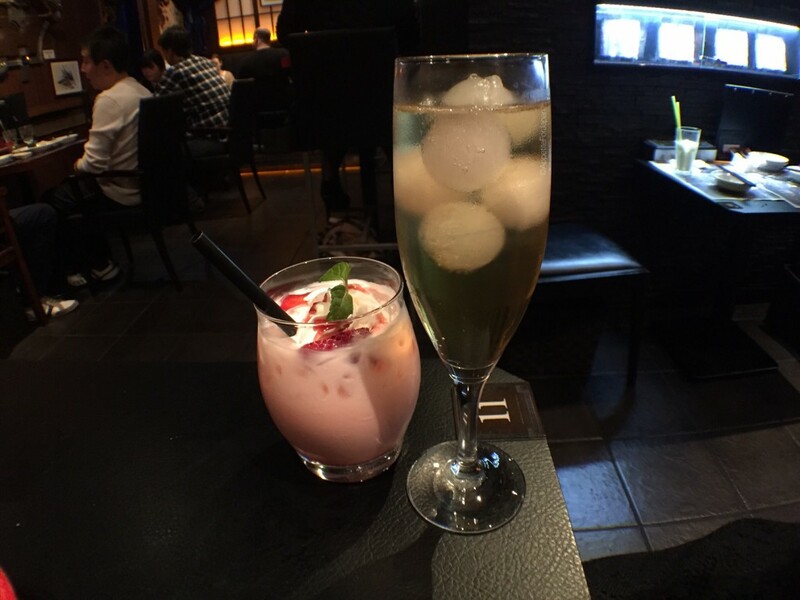 Nothing has changed in that regard, but the presentation of some of the drinks is okay. 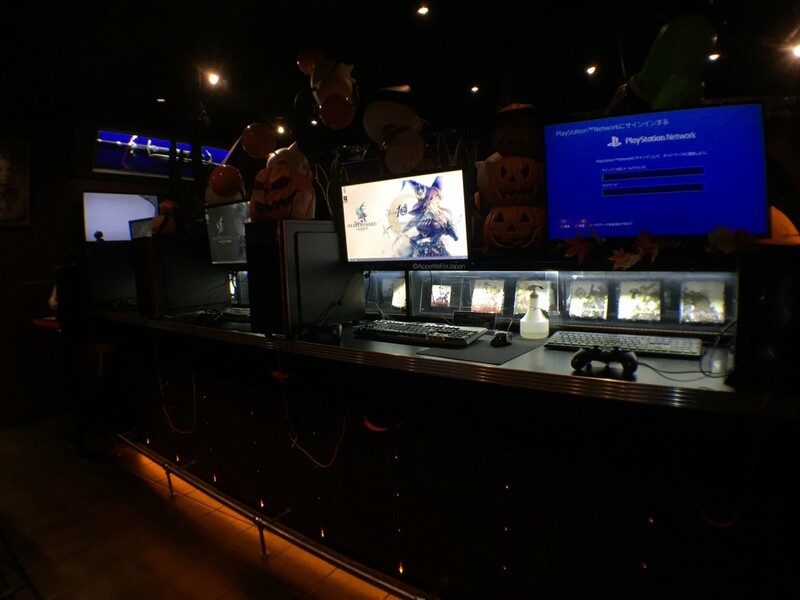 Customers can play Final Fantasy XIV on computer and PlayStation. I didn’t get a proper photo of this last time, so here it is now. If you look closely, you can see some tacky Halloween decorations there too. It was about a week after Halloween, and most places had long since taken their decorations down. As much as I love Halloween, I always feel that Halloween decorations (and the same goes for Christmas, and so on) detract from themed places. If it’s already themed, why add an additional, seasonal theme? 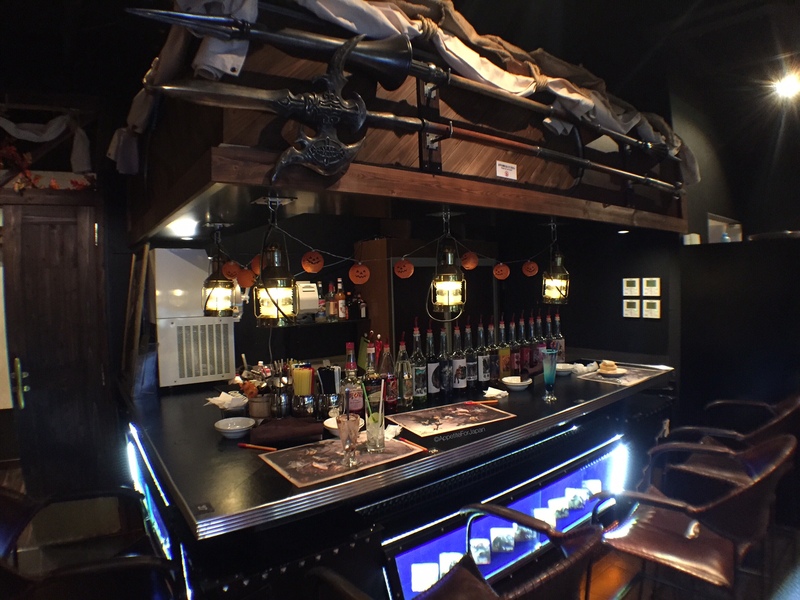 A clearer picture of the bar, because last year the only picture that I took was blurry. 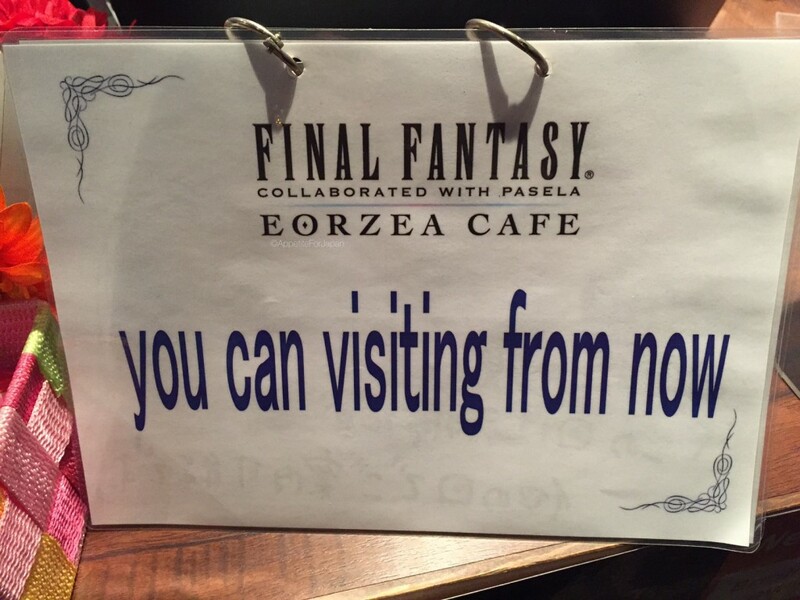 To find out more about Eorzea Cafe, what it looks like inside, the ordering system and for directions on how to get to Eorzea, see my other Eozea Cafe post.